This show has been extended through September 13. Revision: This show has now been extended through September 27. Another Revision: This show, which is apparently completely unstoppable, is now extended through October 30. In the world of local theater, there are two different kinds of musical productions commonly available. One is what is thought of as the “standard American musical,” with a story line enhanced with songs and dances – usually ones which advance the storyline and may be integral to the plot. The other is the “tribute concert,” a chance to recreate a musical group, performer or even revisit a particular performer’s music in such a way that folks can come to the theater to hear either a reenactment of a period concert performance (see “Beatlemania” as foundational in that genre), or come to a celebration of a performer’s music by obviously more contemporary performers, such as when a group of tuxedoed gentlemen take turns singing songs connected to, say, Frank Sinatra . However, there is a third category I tend to refer to as the bio-tribute: it ostensibly tells some tale related to a famed musician, but is actually mostly a chance to hear lots of that performer’s songs. Among these, the most amorphous is “Always, Patsy Cline,” a show based on a true story, written by Ted Swindley. Now at the Sierra Madre Playhouse, it offers two performers a chance to play both sides of the tribute coin: one, who narrates, offers up an entertaining portrait of one die-hard fan’s encounter with her idol. The other plays the songstress herself, and sings the songs Cline was famed for, both in recreated concert settings, and as Cline’s side of conversations with the fan who idolized her. The best news in the SMP production has to be the performers themselves. 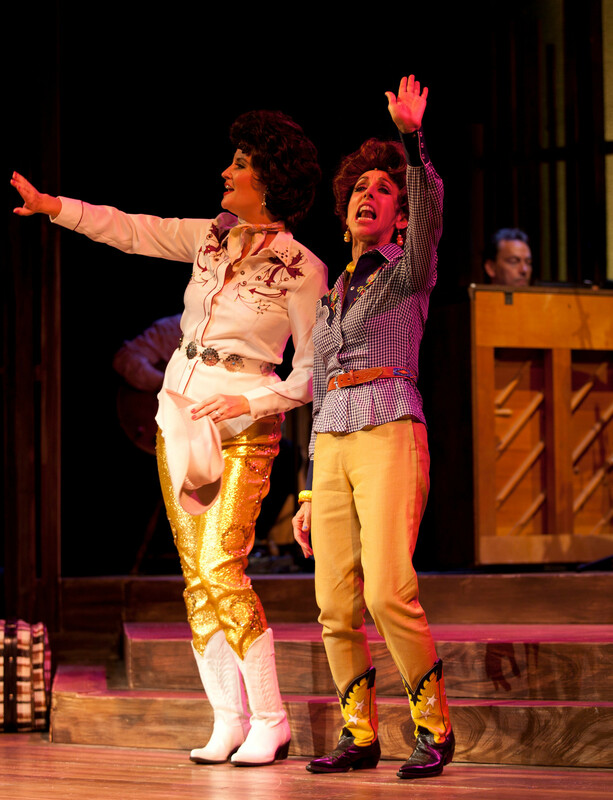 Nikki D’Amico proves a hoot as Louise, the wildly enthusiastic, uninhibited Texan whose wholehearted enthusiasm leads an exhausted Cline to come home with her after a concert gig, igniting a friendship which lasted until Cline’s untimely death in early 1963. Cori Cable Kidder has Cline’s particular vocal styling down fairly well, and thanks to Krys Fehervari’s impressively accurate wigs, looks the part. It’s a carefully underplayed portrait but it works after a fashion, though sometimes it seems that this Patsy Cline is being overwhelmed by Louise’s sheer energy. Director Robert Marra has given the potentially static piece as much action as he can, in large part by giving D’Amico’s Louise a brash physicality – even during many of Cline’s songs – which keeps the visual energy strong. Musical director Sean Paxton has assembled a live band to back up Kidder’s vocals, and with the possible exception of the opening night fiddler, their polish helps create the essential “country” sounds of the various stages of Cline’s career. Also worthy of note is John Vertrees’ impressively expansive-looking country barn, plus separate late-50s kitchen, set on SMP’s tiny stage. A. Jeffery Schoenberg does right by Cline’s wardrobe too – a woman making waves in country music who, early on, eschewed the usual gingham and fringe for sheath dresses and gold lame pants. As a script, “Always, Patsy Cline” seems neither fish nor fowl, but that’s not this production’s fault. For those who just want to sit back and listen to Cline sing her songs, the enthusiastic Louise seems a distraction. For those who want to know more about this particular, factually based relationship between Cline and her most ardent fan, the comparative lack of spoken lines by the legendary singer (who was reportedly quite a lively friend) leaves the tale significantly one-sided. Still, the end result becomes a walk down memory lane for some, and an amusing snapshot of an era and a charmingly pushy fan for others. And, of course, there are those songs, and, truth be told, even this child of the rock era can listen to “I Fall to Pieces” or “Crazy” or “Walkin’ After Midnight” any old time.